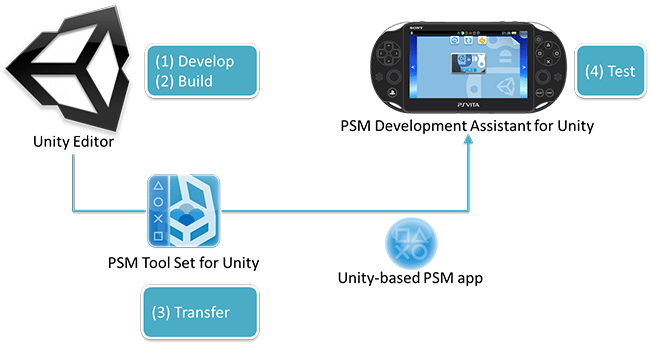 Considering the rather sizeable PlayStation Mobile and Vita user base, this is bound to ring well with Unity developers looking to expand into Sony’s section of the hand-held market. While the currently available license is but a slightly limited preview (no publishing to the PSM Store, for example), it’s still a great way for interested developers to sample the goods, ahead of its scheduled summer launch. Something tells me 2014 is going to be a great year for Android and iOS developers in particular, as games from those systems might make for a perfect fit on PS Mobile and/or PS Vita; all three being touch-screen enabled and all. Heck, certain games might even offer a more enjoyable experience on the Vita, with physical buttons taking the place of those less-than-stellar on-screen buttons. Anyone who’s ever played a 2D platformer with ‘touch controls’ should be familiar with this particular issue. On a somewhat related note, PlayStation Mobile support will be expanding to a dozen new countries come May 29, 2014; the addition of Australia, Brazil, Columbia, India, Indonesia, Malaysia, Peru, Poland, Russia, Singapore, Switzerland and Thailand brings that number to a lovely 32. While this obviously means PSM is not exactly a ‘global thing’ yet, it’s definitely getting there, and don’t forget that we’re talking about a product launched less than a year ago. Anyway, as with all pre-release builds, creating a backup of your work is highly recommended. Sony may ‘heart’ indies and all, but that doesn’t mean they’re responsible for data loss caused by lack of a backup, ya know? With that in mind, those ready to get started can find more details (and register) on this page. Oh and do keep my site in mind, once you’ve managed to craft something awesome and feel it’s time for the world to hear about it, eh?